Don't worry! The annoying watermarks are never on the actual artwork. That is just to protect my art from annoying internet pirates who roam the internet seas. AAAARGH! 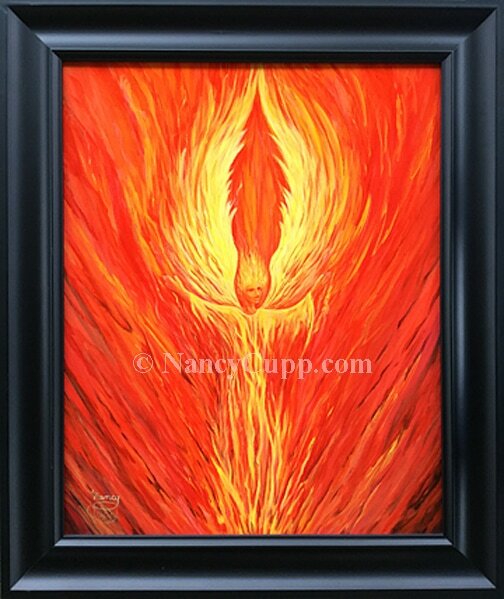 Angel Fire was painted during two Sunday morning church services and finished in the studio. It is based on the scriptures of Psalm 104:4 and Hebrews 1:7. Angels were created to work for God and help people. They function like the military, with different ranks, classifications, and duties. Angels are spiritual beings and never die. They have been around before the creation of our world, but, they had a beginning, like we had. God has existed forever, outside of time and space. It is very hard for us to comprehend the spiritual world, but it is more real than our physical one. Angels operate in the spiritual and physical realm to help God and humanity and obey God’s orders. When God set up this world, he gave dominion and authority to mankind over this earth. At first it was like heaven on earth, until Adam and Eve disobeyed God, then Satan was able to take over. 2 Corinthians 4:4. That’s why there is so much evil and heart ache! Satan came to steal, kill, and destroy, but Jesus came to give us an abundant life. When we become born again, we get our authority back and can do great damage to the kingdom of darkness through prayer. We are never to worship or pray to angels. God is the head over all creation. However, when we pray according to God's will which is found in His Word, the angels can fight more effectively on our behalf. Our prayers have more authority than we may realize. Ps 103:20* Bless the LORD, ye his angels, that excel in strength, that do his commandments, hearkening unto the voice of His word.